Get some cultural insight at Makapuu Lighthouse Trail and Iolani Palace. Eschew the tourist crowds and head to Kailua Beach Park and Koko Crater Railway Trail. Change things up with these side-trips from Honolulu: Lanikai Beach (in Kailua), Polynesian Cultural Center (in Laie) and Stars Above Hawaii (in Kapolei). There's still lots to do: explore the different monuments and memorials at National Memorial Cemetery of the Pacific, take a tour of Battleship Missouri Memorial, look for all kinds of wild species at Malaekahana State Recreation Area, and discover the deep blue sea with a scuba or snorkeling tour. For maps, reviews, and tourist information, read Honolulu online trip itinerary builder . Amsterdam, The Netherlands to Honolulu is an approximately 20-hour flight. You can also do a combination of train and flight. Traveling from Amsterdam to Honolulu, you'll gain 11 hours due to the time zone difference. Traveling from Amsterdam in March, things will get warmer in Honolulu: highs are around 32°C and lows about 23°C. Wrap up your sightseeing on the 15th (Fri) early enough to travel to Poipu. Poipū is a census-designated place in Kauai County on the southern side of the island of Kauai in the U.S. Eschew the tourist crowds and head to Hanalei Beach and Kalalau Trail. Get in touch with nature at Scuba & Snorkeling and Na Pali Coast State Park. Explore the numerous day-trip ideas around Poipu: Puu Poa Beach (in Princeville), Kayaking & Canoeing (in Kapaa) and Hanalei National Wildlife Refuge (in Hanalei). And it doesn't end there: stroll through Poipu Beach Park, look for all kinds of wild species at Wildlife Areas, take an unforgettable tour with a helicopter tour, and explore the striking landscape at Spouting Horn. To find maps, more things to do, ratings, and more tourist information, read Poipu trip itinerary maker tool . Traveling by combination of flight and taxi from Honolulu to Poipu takes 3 hours. Expect a daytime high around 30°C in March, and nighttime lows around 22°C. Cap off your sightseeing on the 20th (Wed) early enough to travel to Kailua-Kona. Get some historical perspective at Pu'uhonua O Honaunau National Historical Park and Kealakekua Bay. Step out of the city life by going to Hapuna Beach State Recreation Area and Honaunau Bay. Explore Kailua-Kona's surroundings by going to The 1871 Trail (in Honaunau) and Kealia Ranch (in Captain Cook). There's much more to do: take your sightseeing to a higher altitude at Mauna Kea, get up close to creatures of the deep with a dolphin and whale watching tour, look for all kinds of wild species at Kona Cloud Forest - Guided Walking Tours, and tour the pleasant surroundings at Kahaluu Beach. For traveler tips, photos, where to stay, and other tourist information, use the Kailua-Kona route planner. Do a combination of taxi and flight from Poipu to Kailua-Kona in 3 hours. In March in Kailua-Kona, expect temperatures between 32°C during the day and 24°C at night. Cap off your sightseeing on the 25th (Mon) early enough to go by car to Hilo. You'll explore the less-touristy side of things at Kilauea Iki Trailhead and Kaimu Beach Park. Escape the urban bustle at Rainbow Falls and Carlsmith Beach Park. You'll find plenty of places to visit near Hilo: Jagger Museum (in Volcano) and Hawaii Volcanoes National Park (Keanakakoi Crater Overlook & Pu'u Huluhulu trail). And it doesn't end there: contemplate the waterfront views at Onomea Bay, take in the dramatic scenery at Akaka Falls State Park, and explore the fascinating underground world of Kilauea Caverns of Fire. To see maps, reviews, more things to do, and other tourist information, you can read our Hilo visit planner . Getting from Kailua-Kona to Hilo by car takes about 2 hours. Other options: take a bus. March in Hilo sees daily highs of 31°C and lows of 22°C at night. Finish your sightseeing early on the 28th (Thu) to allow enough time to travel to Kihei. Eschew the tourist crowds and head to Stand-Up Paddleboarding and Zipline. Visiting Wailea Beach and Napili Beach will get you outdoors. Venture out of the city with trips to Lahaina (Ka'anapali Beach & Lahaina Front Street), Baby Beach (in Paia) and Haleakala Crater (in Haleakala National Park). There's lots more to do: stroll through Po'olenalena Beach, kick back and relax at Sugar Beach, and see majestic marine mammals with a dolphin and whale watching tour. For photos, more things to do, other places to visit, and tourist information, refer to the Kihei online trip itinerary builder . You can do a combination of flight and taxi from Hilo to Kihei in 1.5 hours. Another option is to do a combination of bus, taxi, and flight. In March in Kihei, expect temperatures between 32°C during the day and 21°C at night. Finish your sightseeing early on the 2nd (Tue) to allow enough time to travel to Sedona. Step out of the city life by going to Walnut Canyon National Monument and Devil's Bridge Trail. You'll explore the less-touristy side of things at Oak Creek Canyon and V-Bar-V Heritage Site. Change things up with these side-trips from Sedona: Montezuma Well (in Rimrock) and Painted Desert (in Petrified Forest National Park). There's lots more to do: explore the striking landscape at Bell Rock, cruise along Red Rock Scenic Byway (SR 179), and take in the spiritual surroundings of Chapel of the Holy Cross. 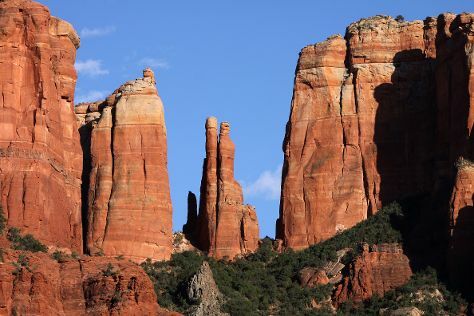 To see photos, ratings, traveler tips, and other tourist information, read our Sedona vacation planner. Getting from Kihei to Sedona by combination of taxi, flight, and shuttle takes about 10.5 hours. Other options: do a combination of taxi and flight. Due to the time zone difference, you'll lose 3 hours traveling from Kihei to Sedona. Expect a bit cooler weather when traveling from Kihei in April: highs in Sedona hover around 26°C, while lows dip to 10°C. Finish up your sightseeing early on the 6th (Sat) so you can go by car to Page. Visiting Alstrom Point and Rainbow Bridge Trail will get you outdoors. You'll explore the less-touristy side of things at Paria River Canyon and All In Boat Rentals. Venture out of the city with trips to Monument Valley Navajo Tribal Park (in Monument Valley), Many Pools Trail (in Zion National Park) and Marble Canyon (Marble Canyon & Cathedral Wash Trail). 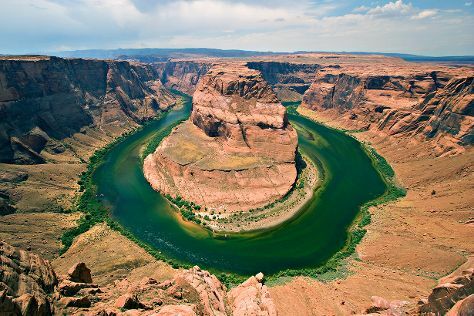 Spend the 11th (Thu) exploring nature at Glen Canyon National Recreation Area. There's much more to do: take in the dramatic natural features at Paria Canyon Wilderness Area, get great views at Horseshoe Bend, and explore the stunning scenery at Antelope Canyon. For traveler tips, photos, maps, and more tourist information, you can read our Page trip planner . You can drive from Sedona to Page in 3.5 hours. Alternatively, you can do a combination of taxi and flight; or do a combination of shuttle and flight. April in Page sees daily highs of 26°C and lows of 10°C at night. Wrap up your sightseeing on the 11th (Thu) early enough to travel to Fredericksburg. Satisfy your inner culture vulture at National Museum of the Pacific War and Texas State Capitol. Get in touch with nature at Enchanted Rock State Natural Area and Kerrville River Trail. Explore Fredericksburg's surroundings by going to Frio Canyon Motorcycle Stop (in Leakey), The Y.O. Ranch (in Mountain Home) and Eckert James River Bat Cave Preserve (in Mason). To find maps, where to stay, reviews, and other tourist information, go to the Fredericksburg road trip site . Getting from Page to Fredericksburg by combination of flight, bus, and taxi takes about 9 hours. Other options: do a combination of flight and car; or drive. Due to the time zone difference, you'll lose 1 hour traveling from Page to Fredericksburg. In April, plan for daily highs up to 28°C, and evening lows to 13°C. Wrap up your sightseeing on the 14th (Sun) early enough to travel to Key Largo. Discover out-of-the-way places like Florida Keys Wild Bird Rehabilitation Center and Fishing Charters & Tours. Visiting Molasses Reef and Scuba & Snorkeling will get you outdoors. Change things up with these side-trips from Key Largo: Islamorada (Bayside Boat Rentals, A Lil' Tail Charters, & more) and Lincoln Road (in Miami Beach). It doesn't end there: admire the majestic nature at John Pennekamp Coral Reef State Park. For ratings, where to stay, other places to visit, and more tourist information, read our Key Largo vacation builder site . You can do a combination of car, flight, and shuttle from Fredericksburg to Key Largo in 10.5 hours. Another option is to drive. Traveling from Fredericksburg to Key Largo, you'll lose 1 hour due to the time zone difference. Traveling from Fredericksburg in April, things will get somewhat warmer in Key Largo: highs are around 33°C and lows about 24°C. Cap off your sightseeing on the 18th (Thu) early enough to go by car to Marathon. Eschew the tourist crowds and head to Dolphin Research Center and Sombrero Beach. Take a break from the city and head to The Turtle Hospital and Scuba & Snorkeling. Step out of Marathon with an excursion to Stand-Up Paddleboarding in Big Pine Key--about 32 minutes away. Next up on the itinerary: immerse yourself in nature at Bahia Honda State Park, get your bearings at Pigeon Key Foundation, kick back and relax at Sunset Park Beach, and choose your vessel at Island Time Boat Rental. For other places to visit, ratings, more things to do, and more tourist information, read our Marathon trip planner . Traveling by car from Key Largo to Marathon takes 1.5 hours. Alternatively, you can take a bus; or do a combination of taxi and bus. Plan for a bit warmer nights when traveling from Key Largo in April since evenings lows in Marathon dip to 28°C. Cap off your sightseeing on the 23rd (Tue) early enough to catcht the bus to Key West. Take a break from the city and head to Dolphin & Whale Watching and Dry Tortugas National Park. Explore hidden gems such as Scuba & Snorkeling and Fort Zachary Taylor. Change things up with a short trip to Fort Jefferson in Dry Tortugas National Park (about 1h 40 min away). There's much more to do: identify plant and animal life at Key West Butterfly & Nature Conservatory, get engrossed in the history at Truman Little White House, take a memorable drive along The Overseas Highway, and cast your line with a fishing tour. To see more things to do, reviews, traveler tips, and tourist information, read Key West planner . Traveling by bus from Marathon to Key West takes 1.5 hours. Alternatively, you can drive. In April in Key West, expect temperatures between 33°C during the day and 27°C at night. Finish your sightseeing early on the 27th (Sat) so you can travel to Sanibel Island. Your cultural itinerary includes sights like Sanibel Island Lighthouse and St. Isabel Catholic Church. Take a break from the city and head to Bowman's Beach and Lovers Key State Park. Explore Sanibel Island's surroundings by going to Fort Myers Beach (Fort Myers Beach & Dolphin & Whale Watching), Edison & Ford Winter Estates (in Fort Myers) and Barefoot Beach Preserve (in Bonita Springs). There's still lots to do: tour the water at your own pace with Tarpon Bay Explorers, admire the natural beauty at In The Garden, and look for all kinds of wild species at Sanibel Captiva Conservation Foundation. To find ratings, maps, where to stay, and other tourist information, read our Sanibel Island journey planning app . You can do a combination of flight and taxi from Key West to Sanibel Island in 3 hours. Alternatively, you can do a combination of ferry and taxi; or drive. Expect a bit cooler evenings in Sanibel Island when traveling from Key West in April, with lows around 22°C. Cap off your sightseeing on the 1st (Wed) early enough to go by car to St. Augustine. SAINT AUGUSTINE | PONTE VEDRA on Florida's Historic Coast The Nation's oldest city (est. Step off the beaten path and head to Stetson Mansion and Fort Matanzas National Monument. Bulow Plantation Ruins Historic State Park and Castillo de San Marcos are good opportunities to explore the local culture. Change things up with these side-trips from St. Augustine: Ravine Gardens State Park (in Palatka) and Beach at Daytona Beach (in Daytona Beach). There's lots more to do: kick back and relax at St. Augustine Beach, explore the galleries of St. Augustine Lighthouse & Maritime Museum, identify plant and animal life at St. Augustine Alligator Farm Zoological Park, and brush up on your knowledge of spirits at St. Augustine Distillery. For reviews, other places to visit, photos, and more tourist information, you can read our St. Augustine trip itinerary maker app . Drive from Sanibel Island to St. Augustine in 6 hours. Alternatively, you can do a combination of taxi, flight, and bus; or do a combination of taxi, bus, and flight. While traveling from Sanibel Island, expect a bit cooler days and about the same nights in St. Augustine, ranging from highs of 33°C to lows of 22°C. Cap off your sightseeing on the 5th (Sun) early enough to go by car to Savannah. Visit Fort Pulaski National Monument and Tybee Island Lighthouse Museum for their historical value. Satisfy your inner culture vulture at Olde Pink House and Savannah Historic District. Get out of town with these interesting Savannah side-trips: Tybee Island Beach (in Tybee Island) and Hilton Head (Dolphin & Whale Watching & Coligny Beach). Next up on the itinerary: identify plant and animal life at Savannah National Wildlife Refuge, stroll through Forsyth Park, stroll the grounds of Bonaventure Cemetery, and contemplate in the serene atmosphere at Cathedral of St. John the Baptist. Plan a trip to Savannah easily and quickly by telling Inspirock to suggest an itinerary. Traveling by car from St. Augustine to Savannah takes 3.5 hours. Alternatively, you can take a bus; or do a combination of bus and train. In May, plan for daily highs up to 33°C, and evening lows to 20°C. Finish your sightseeing early on the 8th (Wed) to allow enough time to travel back home.